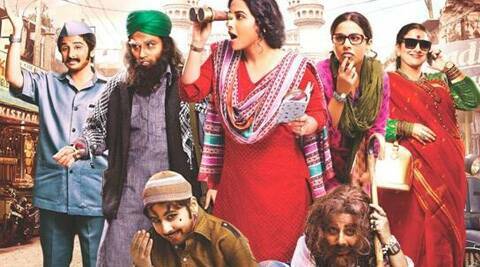 Bobby Jasoos, played by Vidya Balan with verve and a twinkle? Up to a point, yes. I quite enjoyed the build-up, in which we see Bobby careering around her bustling Hyderabadi locality, accent and body language pretty much in place, trying to get her ‘jasoosi’ business going. Her co-conspirators range from a plump internet café owner to a tall, rangy tech support-type fellow. And a good-looking, ambitious neighbour (Ali Fazal) who tags her as she goes about solving the one big case flung in her lap by a taciturn Pathan called, what else, Khan (Kiran Kumar). The smiles pile up as Bobby gets to the point of hanging up her shingle, announcing the arrival of a new ‘jasoos’, despite her growling ‘abba’. She is supported by her loving ‘ammi’, and sharp-tongued ‘khala’ (Supriya Pathak, Tanvi Azmi respectively) and beautiful cousin (Anupriya Goenka), who’s having a little ‘chakkar’ with a brooding, heavily kohl-eyed fellow (Arjan Bajwa). We get a Hyderabad minus the stereotypical showing of the Charminar, and lots of busy ‘biryani’ eateries, which become a plot-point. Nice. And a well-done middle-class Muslim homestead involved with ‘roza’ and ‘sehri’ and communal breaking of fasts, and the ladies’ continuous engagement with loud TV serials, one of which acts as a smart counterpart to what Bobby wants to do: there’s a flash of ‘CID’, Indian TV’s longest running detective serial, and we dutifully snicker. And that’s just it. There should have been more laughs in this thing. Vidya Balan is all over the movie, really trying to make a zesty meal of her role, even if her tone remains the same in all those over-the-top disguises. But the leading lady and her fine supporting cast (especially Ali Fazal, who holds his own) is let down by the writing, which loses steam after the half-way mark, and becomes an improbable re-up of a Manmohan Desai-style lost-and-found saga. There’s also a strange minatory layer about ‘independent’ girls and how they upset the system: that’s the whole point of a Bollywood leading lady top-lining a female-centric movie, and not a superstar Khan or a Kapoor, isn’t it? ‘Bobby Jasoos’ works till the time Vidya Balan gets to lead from the front: the courtship with her reluctant suitor is one of the high points of the film. But I wish this amiable, light-hearted yarn had more ‘zaika’ and ‘tadka’. And the songs are strictly unnecessary and uninteresting. Post-interval, the surprises leachout. So does the fun.